Evaluating the most important, most valuable position in football isn’t easy. Quarterbacks can’t be defined by any one number, not a box-score stat or advanced statistic. As such, quantifiably measuring the success of the NFL’s signal-callers requires multiple numbers, PFF’s grading system and advanced stats – both included and not included in Premium Stats 2.0. Some of PFF’s well-known advanced stats used to measure quarterback success include adjusted completion percentage, passer rating under pressure, passer rating when kept clean and time to throw. We also chart quarterback success on deep passes – passes thrown 20-plus yards through the air – and play-action dropbacks. Adjusted completion percentage takes box-score completion percentage to the next level. The formula: ((Completions + Drops) / (Attempts – Throw Aways – Spikes – Batted Passes – Hit As Thrown)). Removing throwaways, spikes, batted passes and passes released while being hit creates a completion percentage that’s more indicative of quarterback accuracy and success. Outside of Premium Stats 2.0, PFF’s team of analysts, including former NFL signal-caller Zac Robinson, chart ball location for quarterbacks to better evaluate quarterback accuracy across the NFL and FBS. PFF also makes a note of what we call big-time throws and turnover-worthy plays, the former being any attempt that receives a raw grade of +1.0 or higher in our system and the latter representing any dropback that receives a raw grade of -1.0 or lower – this includes dropped interceptions. PFF’s quarterback charting continues to grow, as well. Our analysts have now started to chart quarterback decision (i.e., first read, checkdown), targeted route, incompletion type (i.e., dropped pass, pass breakup) and much more as we continue to develop our skills, add to our staff and learn more about the stable, valuable elements of quarterback play. New Orleans Saints veteran signal-caller Drew Brees recorded an impressive 82.2 adjusted completion percentage in the regular season, leading all 27 NFL quarterbacks with at least 400 dropbacks in 2018. Opposite of Brees, Arizona Cardinals rookie quarterback Josh Rosen finished 27th in adjusted completion percentage at 67.9% in 2018. And fellow rookie Sam Darnold finished just ahead of him at 69.7%. Brees’ name comes up again when discussing the best deep passers in the NFL in 2018. He led all 27 NFL signal-callers with 40-plus deep (20-plus air yards) attempts in passer rating (128.6) and adjusted completion percentage (52.7%) on deep passes. He completed 28-of-55 attempts for 871 yards and nine touchdowns on throws of 20-plus air yards. Here, Brees drops a deep toss right into the bread basket as his receiver, Ted Ginn Jr., comes up open down the right sideline of the end zone. This is one of many pretty deep passes had in 2018. Kansas City Chiefs’ sophomore phenom Patrick Mahomes had his fair share of success heaving the ball deep, as well. He led the same group of deep throws in deep passing yards (1,514) and yards per attempt on deep passes (16.5) during the regular season, completing 44-of-92 deep shots in the process. Mahomes’ deep-ball success gets better when you turn on the film. His ability to heave the ball deep, off-platform and on the run is unparalleled in the NFL, as exemplified on the deep pass below to one of the NFL’s best deep receiving talents in Tyreek Hill. Mahomes fires a strike to Hill while sprinting to his right to avoid pressure and almost effortlessly has the ball fly through the air 20-plus yards on a rope. Throws like the one above make for great additions to Mahomes’ highlight reel. His ability to make accurate, downfield passes out of structure, on the run, off-platform is truly jaw-dropping. However, it’s his play inside the structure, not under pressure is what stands above the rest in the NFL. 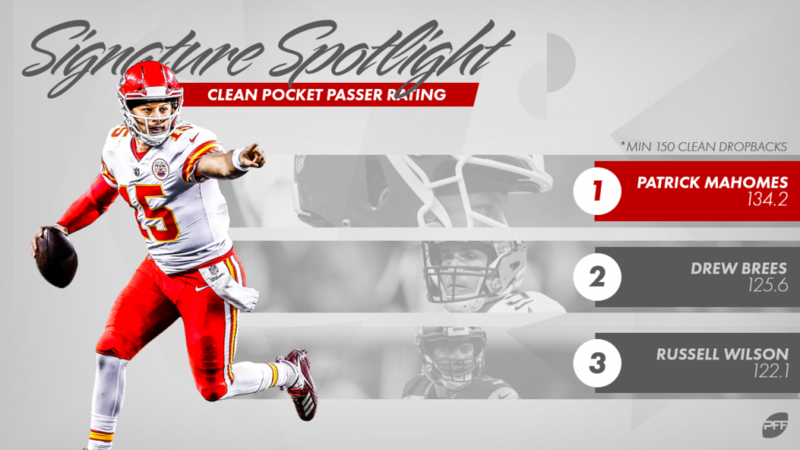 Completing 295-of-395 passes for 3,744 yards, 41 touchdowns and just four interceptions from a clean pocket, Mahomes recorded a league-high 134.2 passer rating when kept clean throughout the regular season in 2018. Brees finished second at 125.6, and Buffalo Bills rookie quarterback Josh Allen finished last at 79.8. Performance from a clean pocket, per PFF’s data scientists Eric Eager and George Chahrouri, has proven stable year over year in the NFL, which includes passer rating and PFF passing grade from a clean pocket. Conversely, play under pressure is extremely volatile year over year but still a valuable metric to study when evaluating single-season performances. Houston Texans’ Deshaun Watson, who was under pressure more than any other quarterback in 2018, thrived while under duress. He recorded an NFL-high 88.2 passer rating under pressure, completing 106-of-183 attempts for 1,443 yards, nine touchdowns and five interceptions in the process. In the play above, Watson avoids pressure brought on by Philadelphia Eagles’ Brandon Graham and escapes left while keeping his eyes downfield. He then gets off an accurate pass to DeAndre Carter just before he’s taken down by another Eagles defender. Seattle Seahawks’ Russell Wilson also finished with a high passer rating under pressure (88.2) and led all quarterbacks in PFF’s big-time throw percentage (8.9), meaning he had the highest percentage of attempts graded as a +1.0 or better among qualifying signal-callers. Wilson’s 35-yard touchdown pass down the right sideline to David Moore against the Carolina Panthers in Week 12 was charted as a big-time throw – and for good reason. Wilson fits the deep shot right over the head of Panthers cornerback Corn Elder and into the waiting arms of Moore for the score. Green Bay Packers’ Aaron Rodgers ranked just fifth in big-time throw percentage (5.9) but led all qualifiers in turnover-worthy play percentage, recording one on just 1.0% of his dropbacks in 2018. Tampa Bay Buccaneers’ Jameis Winston finished on the opposite end with a league-high 4.5 turnover-worthy throw percentage. Here, Winston tries to force a deep pass to DeSean Jackson but ends up hitting Dallas Cowboys safety Jeff Heath right in the hands. Heath drops it, leaving the pass as just an incompletion in the box score, but PFF charts the throw as turnover-worthy.